Thinking of coming to Disneyland this week to check out Gay Days, the Halloween festivities, or just because? 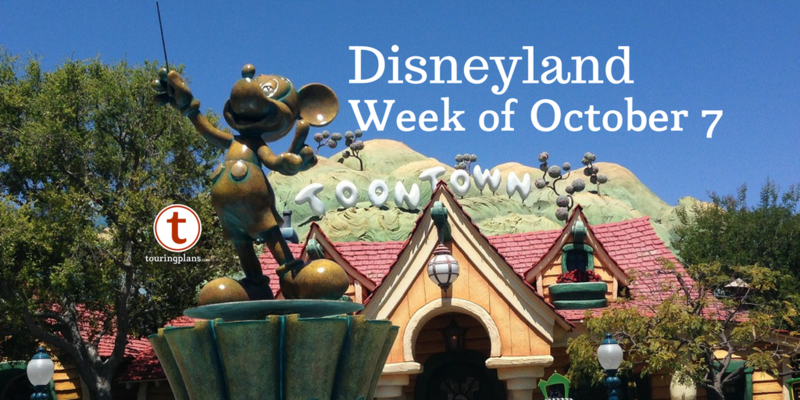 Read on to find out what to expect in this week’s Disneyland preview! The week starts with the continuation of Gay Days at Disneyland Resort. Gay Days are way for members of the LGBT community to get together with their friends and families and enjoy a few days at the parks. It is not an official, Disney-run event, so there are no special activities or merchandise provided by Disney, but the event organizers will designate one park for Gay Day participants to visit on each day. 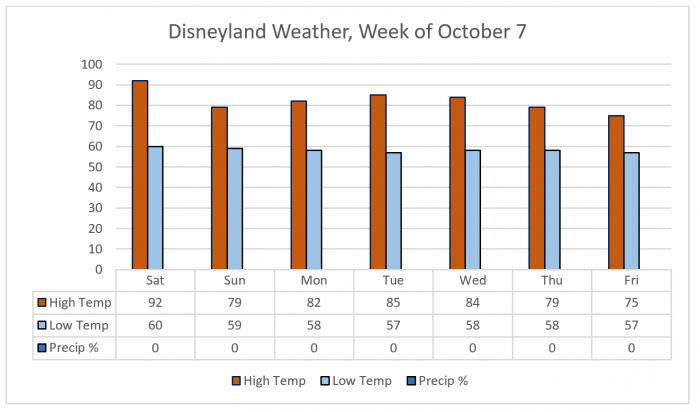 Disneyland Park is the designated park for Saturday and California Adventure is the designated park on Sunday, so expect more participants at those parks on those days. As with any large group converging upon the parks, we’re expecting an uptick in crowds for the weekend, with both days at level 8 for the resort. For more information, check out the official website for Gay Days Anaheim. Monday is Columbus Day, which means that schools will be closed, and the parks will be busier than they would ordinarily be on a typical Monday. On the upside, bigger crowds means a more complete show schedule, so it’s an opportunity to see Fantasmic! and/or the fireworks if you can’t make it over the weekend. Also, while Mickey Mouse has been talking at Walt Disney World for some time now, Disneyland is now testing a meet and greet at Disney’s California Adventure where Mickey, Minnie, AND Donald all talk, TOGETHER, to you and each other. It’s pretty fantastic, so check out a video of it here. Note that because it’s currently being tested, no set schedule is available as this goes to press. We’ll let you know as soon as it becomes something you can plan for; for now, just keep your eyes peeled! 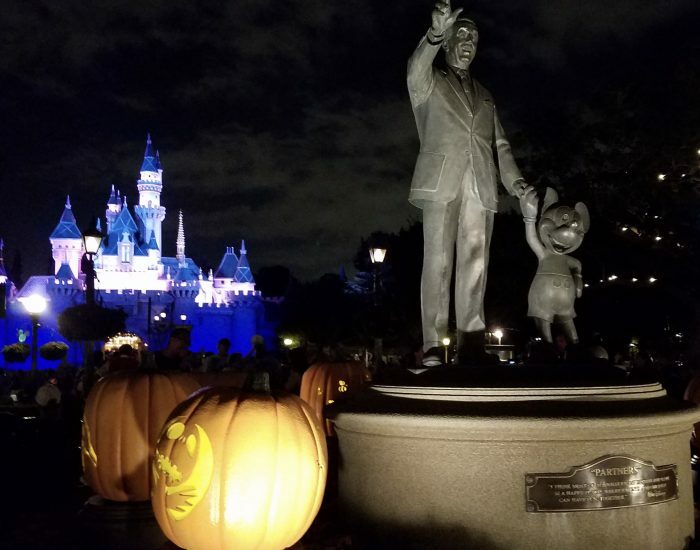 Halloween season remains in full swing at the Disneyland Resort now, and three attractions have received Halloween makeovers: Haunted Mansion Holiday, Space Mountain: Ghost Galaxy, and Guardians of the Galaxy: Mission Breakout have received the Halloween treatment. In the evenings, Mission Breakout transforms into Guardians of the Galaxy — Monsters After Dark. Expect long lines in the evenings for this attraction, and snag a FastPass timed for the end of the night if you can. The attraction will remain in its normal mode during the day. Mickey’s Halloween Party continues this week, and will be happening on Tuesday and Friday. Make sure you check out Guy’s preview for all of the details, and to learn how to get the most out of it. Note that this week’s parties are sold out (as are all other parties this season). There is, of course, special merchandise available in conjunction with the parties. Have you had a chance to check out the new Halloween-themed overlays at Disney’s California Adventure or the seasonal treats? The Haul-o-Ween overlay in Cars Land is extremely well done — the land really goes through a complete transformation for the season. The lighting effects on the rockwork at Radiator Springs Racers, in particular, are incredible. Also, lots of your favorite characters are dressed up for the holiday, there’s lots of unique and fantastic PhotoPass opportunities, and of course there is plenty of Halloween merchandise you can buy. Check out Rikki’s preview for more information about what to expect. 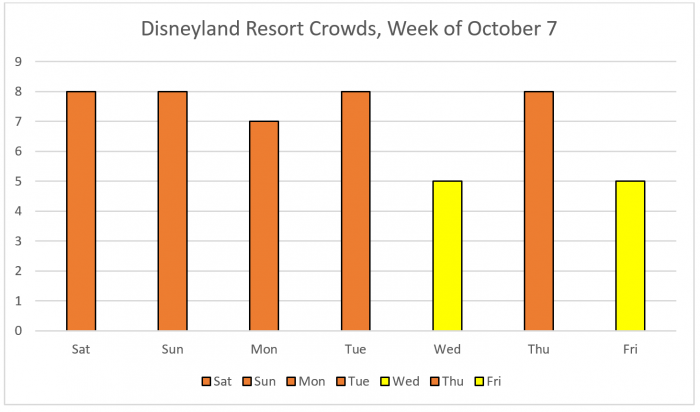 Crowds at Disneyland continue to tick up compared to past weeks, with most days seeing 7 and 8 level crowds. Wednesday and Friday will see the lowest crowds, although Friday is a party day. Accordingly, from a crowd standpoint, Wednesday is the best day to target if you don’t have party tickets. With the exception of an uncharacteristically hot Saturday, which will top out at 92, the rest of the week will be fairly nice — dry, with highs hovering the upper 70s and low 80s. Disneyland Resort has a full slate of shows on the weekend, and a very lean schedule on the other days. Note that special shows will run at Disneyland Park for evenings with the Halloween Parties; consult the daily schedules for Tuesday and Friday for more details on those shows. Detailed show schedules, including stage shows like Mickey and the Magical Map, can be found here. Disneyland Park will be closing early on Tuesday and Friday for Mickey’s Halloween Party. All of those parties are sold out, so if you don’t already have tickets, be aware that you’re not going to be able to go to Disneyland Park on those evenings. California Adventure, however, will be open on all nights and open late on Friday. The same schedule that has been in place lately continues: Southern California Passholders are blocked out on Saturday, while Southern California Select Passholders are blocked out on Saturday and Sunday. All other Annual Passports will be honored all days of the week. For those of you buying tickets as day guests, single-day tickets are at Regular cost ($110 adult/$104 child) all days this week. As per usual, the parks will open one hour early for eligible guests at Disneyland Park Saturday, Tuesday, and Thursday, and at Disney’s California Adventure Sunday, Monday, Wednesday, and Friday. Resort guests can take advantage of these hours every day of their stay for Extra Magic Hours, while guests eligible for Magic Mornings can use that benefit one day at Disneyland Park only. Full park hours can be found by clicking on each date in the Crowd Calendar. At Disneyland Park, Big Thunder Mountain is closed for refurbishment through October 20, and River Belle Terrace remains closed, but everything else is up and running. At California Adventure, Goofy’s Sky School is currently closed. Everything else is currently open. Looking ahead, it’s a small world will be closed from October 23 through some time in November, and Space Mountain: Ghost Galaxy will be closed on November 1 only to remove the holiday overlay and restore it to its classic form. It’s Tough to Be a Bug! is also undergoing a brief closure from October 23-November 3. Keep those dates in mind if those attractions are an important part of your trip! As always, you can see the full slate of refurbishments by checking here. The Most Highly-Coveted, Heavily Sought-After Disney Awards: TouringPlans’ 2013 Planies!